Starring in First Grade: Monday Made it with a Little Tape and Spray Paint! Monday Made it with a Little Tape and Spray Paint! 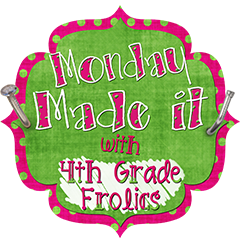 After reading all of the fabulous project linked with Monday made it, I had to join! All of my projects have been completed with spray paint and decorative tape! My classroom theme is Hollywood but I have incorporated a little chevron! I have found chevron packing tape at Target first and then bought one roll of Chevron Duct Tape at Mardel's teacher sale! I wanted to buy more of the chevron duct tape but before I made it back to Mardel I found the same pattern at our local Habitat for Humanity Store for half the price and I went a little crazy! My first project that started a domino effect was a red shelf that went from being used for a storage to a mailbox system for students' take home folders. I didn't take a before picture but the edges had soooo many paint chips and I didn't have the time to sand and paint it so instead I lined the edges with the red and white packing time and wallah! My next project was transforming a purple shelf to lime green lined with chevron only using spray paint and duct tape! The shelf will be used for my inside recess and free play centers for Fun Fridays! After this I was on a roll and continued to transform my white extra supply bins into red with chevron using spray paint that is specific to plastic and packing tape! Probably every shelf will be edged with chevron before school begins!! I have also used the packing tape to hang posters which is functional with flair! Before I met Mr. Livers, I had been a bridesmaid many many times and I have every dress saved! My mom took about half of the dresses and made them shorter in order to create a bin of dress up clothes that will be great for inside recess and fairy tale units! There are so many memories in the bin of old dressed! Yes I do and I feel the same way!!! I love the green bookcase! Duct tape and paint go a long way! Everything looks great! Thanks so much! I will definitely check it out and link up!! I can't believe that there's chevron packing tape! Did it come in different colors? I'm going to have to check that out. There were other colors and patterns of packing tape but only one chevron pattern! I've never thought of lining bookshelves with duct tape! BRILLIANT! Everything looks better with a little chevron! :) And, to use your bridesmaid dresses as dress up for your fairytale unit....LOVE it!! Those little girls will be in heaven! Currently I am little obsessed with Chevron!! I'm your newest (34th, I believe) follower. I love the painted bins with the tape!! I tell you, spray paint is like a miracle in a can! Also like the curtains!!! My mama is also my personal seamstress...don't tell her I said it. She can make ANYTHING and I am so grateful that she's willing to help me out. Come on over to my new blog and follow me too. Thanks for following!! I will check out your blog! !